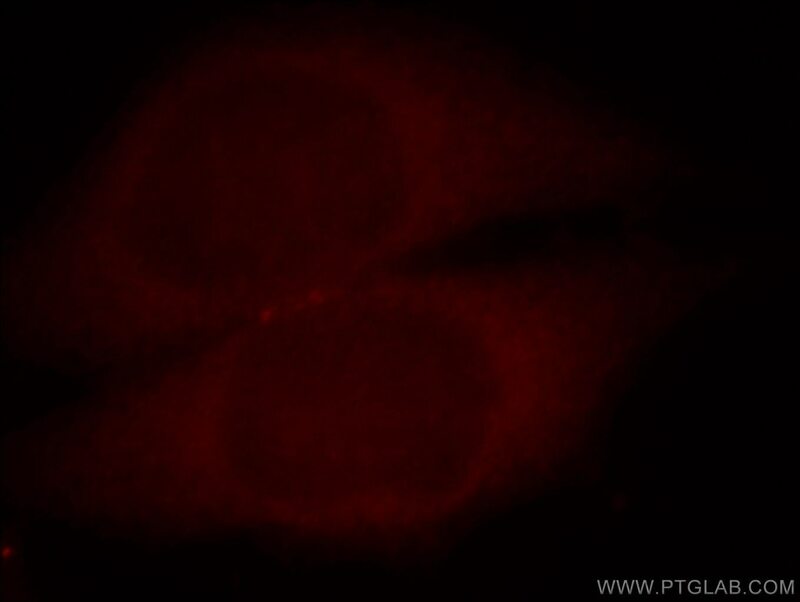 Immunofluorescent analysis of Hela cells, using CASR antibody 19125-1-AP at 1:25 dilution and Rhodamine-labeled goat anti-rabbit IgG (red). CASR, also named as GPRC2A, PCAR1, belongs to the G-protein coupled receptor 3 family. Changes in extracellular calcium are thought to modulate a balance between proliferation and differentiation in a variety of cell types. The activity of CASR is mediated by a G-protein that activates a phosphatidylinositol-calcium second messenger system. It has been shown to play a major role in regulating parathyroid hormone secretion and subsequently influencing the calcium concentration of extracellular fluids. In normal primary keratinocytes and breast epithelial cells, proliferation is inhibited and elevated extracellular calcium levels trigger differentiation. Malignant transformations of these cell types are accompanied by a loss of responsiveness to the anti-proliferative effects of elevated extracellular calcium. Several disorders of calcium homeostasis have been linked to mutations in the CaSR. These include familial hypocalciuric hypercalcemia (FHH), neonatal severe hyperparathyroidism (NSHPT), and autosomal dominant hypocalemia (ADHypo). The 60-65 kDa band detected by this antibody might represent a degradation product of CASR (PMID: 15718278). miR-429 and miR-424-5p inhibit cell proliferation and Ca2+ influx by downregulating CaSR in pulmonary artery smooth muscle cells. Role of autophagy in cadmium-induced testicular injury. Astragaloside IV attenuates myocardial ischemia/reperfusion injury in rats via inhibition of calcium-sensing receptor-mediated apoptotic signaling pathways. Calcium Sensing Receptor-Related Pathway Contributes to Cardiac Injury and the Mechanism of Astragaloside IV on Cardioprotection.